the one where I convince you to wake a sleeping baby. If you feel an overwhelming need to go grab your baby out of bed, no matter how old they are, and squeeze the ever loving daylights out of them? I don’t blame you one teeny little bit. so sweet. you are blessed, casey! V looks just like Cody. I can not believe how big Addie is. She looks like she is enjoying having a little sister. And may I say, both your girls have amazing hair! Addie looks so much like you! Gorgeous girls, gorgeous pictures! Thanks for sharing. Seeing babies is a horrible reminder that my little ones are growing up. But your Vivi is so darn cute it almost hurts. 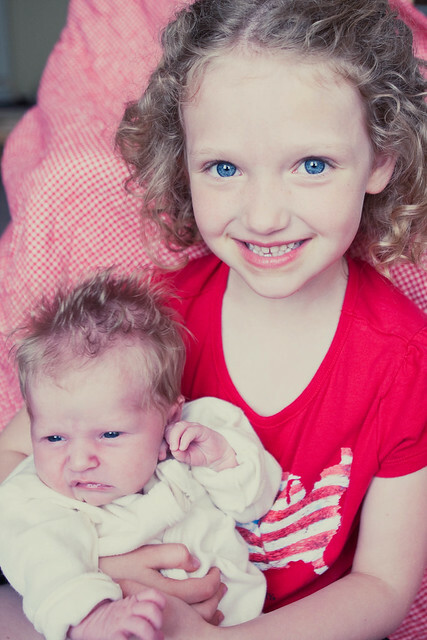 And Addie looks like such a proud big sister. You are one lucky Momma! Oh your girls are so beautiful! I just checked in on Elise. Nolan always accuses me of being too loud and waking her. So what. Haha – my grand baby lives just a few miles away from me and I am tempted some nights just to drive over there and give him a little hug. Not so sure my daughter would appreciate me waking him up to do that:) But I am tempted! I don’t have children of my own but my niece just turned 7. It is going way to fast, even as the aunt who sees them once a week. I am always taking photos of them and hugging them because every time I see them. Congrats to you & your beautiful family! Love that photo! I miss the squeezy days… though my 10yo son still lets me give him a squeeze each night. Yep. I feel ya. we’re on vacation and I’ve been lying down with Dean until he falls asleep every night “because he’s in unfamiliar surroundings.” Kid could sleep through a monster truck rally. Mama needs snuggles. I showed my fiance that picture and his comment was that Vivi looks like she’s impersonating Charlie Sheen in this picture. I dunno about that. She’s definitely winning though. And Addie’s growing up so purty!! With two girls that pretty, I’d advise Cody to start practicing his aim and invest in a shotgun if he doesn’t already have one. Ack! Addie was so cute! And still is! I love Vivi’s expression in that picture. Do you think she is going to have curly hair too? And this is why I still sleep next to my three year old. I can’t let go. Oh my goodness. Such beautifully perfect girls you have! They are so sweet! I hope my kids have hair like your girls! I LOVE it! You make me want to have another baby. Almost. What cute little girls you and the hubby make! Addie was gorgeous then and now, she is just beautiful. Vivienne is also just a bundle of beauty. Enjoy them, it really does go very fast. Addie has never looked so much like your mini-clone than in that photo. I love Vivi’s look. Ha. now where is my Eddie? I check on my babies every night before bed, I hug and kiss each one of them. They grow too fast not to. Oh my goodness! Yes, they grow up too fast. I just got to take pictures of my best friend’s new baby yesterday and while my boys were much bigger at birth… yeah. She’s tiny! (and Vivi looks so much like Cody! + or – the expression? Bittersweet is the only word I can use to describe watching my children grow up. They are now 8,5,and 2 and I don’t know where the time has gone. BTW, your two are so cute! At 16 and 17, mine come and wake me up for a hug – especially if I’ve taken the opportunity for a nanna-nap! These girls… they need to stop it with the growing. They grow too fast! She is beautiful and so is Vivi. I am way behind the times and missed her birth announcement. Congrats, I am sooooo happy for you! I have followed your posts about your journey to have her. Praying for her and you! o my gosh! i love the look on vivi’s face. priceless!